A deliciously fudgy molten lava miniature cookie cup that tastes like a brownie! This seven-ingredient dessert is absolutely delicious and perfect for holiday baking. Molten lava cookies are an idea I’ve had for months now. And finally, it is here!! The husband and I are pretty obsessed with molten lava cakes. In fact, we have a family tradition that involves having them every single Thursday. Although, honestly, I’m pretty sure I’m the only one that knows about this tradition since I’m just now deciding it is going to be one. For the past month I think we’ve had one every single Thursday on our weekly date, so now I just need to tell the husband that it’s going to continue to happen every Thursday. When we go out to dinner the very first thing we do is look at the dessert menu for a molten lava cake. If there is one, we always order it. If we are too full, we get it to-go AKA we eat it on the car ride home 🙂 So naturally I’ve wanted to re-create delicious molten lava goodness, but in cookie form. Since we have the cakes on Thursdays, we now can have cookies every other day, right?! These cookies aren’t your easiest cookies ever, but they aren’t too hard either. It’s mostly just the waiting game which is never super fun to do, but trust me, it’s totally worth it for these. And I mean, with 7 ingredients there’s no way you can pass these up!! One of those ingredients is a brownie mix – hence the brownie taste and flavor in the cookie cup form. The important thing to note here is make sure you get the right sized brownie mix. I call for an 18.4 ounce brownie mix and it’s important to get this size so all the ingredients work together. Other important notes: freeze the chocolate balls! If the chocolate balls aren’t entirely frozen through then the brownie cups won’t be very molten. Fudgy, extremely. Delicious, absolutely. But molten flowing chocolate? Not so much. 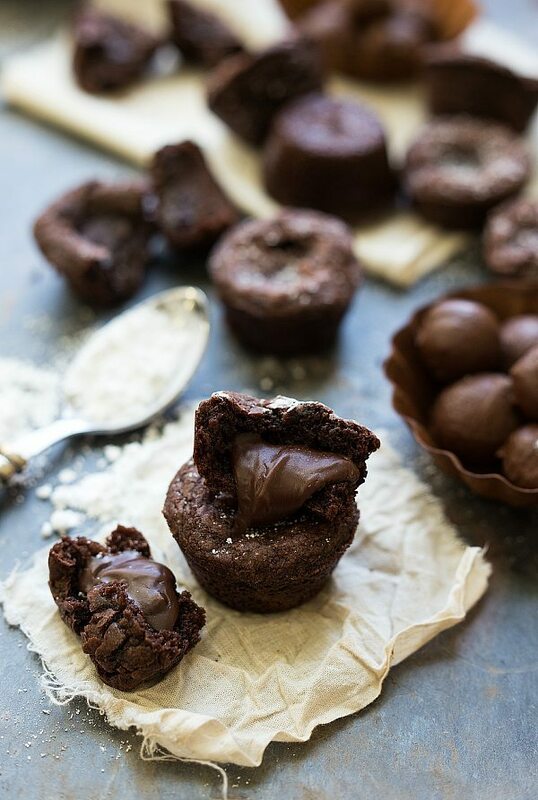 Along with getting molten brownie cups instead of just fudgy brownie cups, here are a few more tips: The less brownie mix around the chocolate balls the better. The more brownie I would put around the chocolate balls, the less molten it would become. Try to just *barely* cover the chocolate ball with the brownie mix. When you put these in a miniature muffin tin, they should fill it up about 3/4ths the way and no more. The next key is slightly under-baking. If you bake these guys all the way through, the chocolate ball will bake too. I like to slightly under-bake them and then let them set up like that. If you are dying to get that warm, right out of the oven taste and “chocolate lava flow” (who isn’t?! ), you can always place these in the microwave for 5-10 seconds after they have cooled down. AKA this is how I eat all of the cooled ones because it’s the best. In a medium pan over low heat, combine the chocolate chips, sweetened condensed milk, and the pinch of salt. Stir constantly until the chocolate is melted and smooth. Remove from the heat and stir in the vanilla. Pour the mixture evenly in a parchment lined 8 x 8 pan. Place in the fridge and allow to harden for at least 2 hours. Using a 1/2 teaspoon measuring spoon, scoop out small bits and roll them into balls. Place the balls on a plate, cover, and freeze until completely frozen through. Preheat the oven to 350 degrees F. Generously grease a miniature muffin tin and set aside. Beat together the brownie mix, butter (not melted, just at room temperature), and the large egg until completely combined. 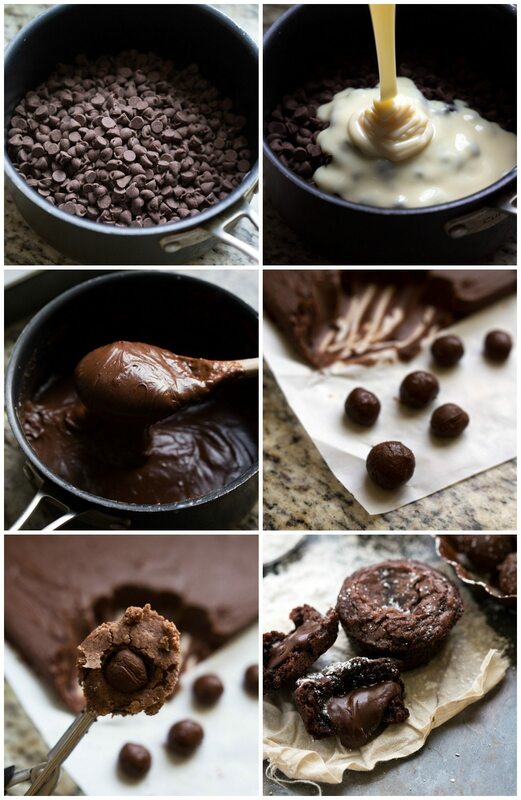 Surround one of the chocolate balls with the brownie dough. The less surrounding the chocolate ball, the more "molten" the chocolate will be. Place the cookie brownie balls into the prepared muffin tin. They should only fill the muffin tin 3/4ths the way. Bake for 12-14 minutes remembering the key to the molten is slightly under-baking these. Remove and allow to cool. Twist out (or coax with a spoon) of the muffin tin. Enjoy optionally topped with a sprinkle of powdered sugar. For a molten treat later on, microwave these for 5-10 seconds and enjoy! Hahah! I love how you have ‘molten lava goodness’ covered for every day of the week. Good plan! These look amazing! Can’t wait to make them! 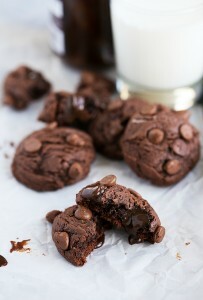 Molten lava cakes are my absolute favorite, so I’m loving these cookies, Chelsea! What a fun and creative idea! I could definitely eat way too many of these babies. Pinned! Wow!! These look amazing! I would have NO self control with these around! 🙂 And beautiful pictures!! Oh my gosh!!! These are a chocolate lover’s dream!!! I am dying to try this!!! Hahaha, I can just picture you two on the car ride home. This is too easy for such a pretty dessert! Holy goodness, Chelsea! These are insane! And I am totally on board for the “Molten Thursday” idea! Definitely making these ASAP! Mind blown, that’s what I am! These look SO good chelsea! Love how simple the ingredient list is as well! Pinned! With seven ingredients how can i not be running to the kitchen to make these?! Beautiful and indulgent. Perfect. pinned! These would be so dangerous in my hands! And I have zero patience, so would totally be picking at the filling before it’s properly set! Amazing, I want to grab one right out of my screen! GOODNESS!!! OMG. I feel like I can’t even get words out. Lol. Looks amazing girl! 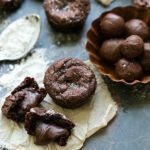 I’m also a big fan of molten chocolate lava cakes, and these brownie cookie cups look out of this world good!! I’ll definitely try making these this upcoming weekend! 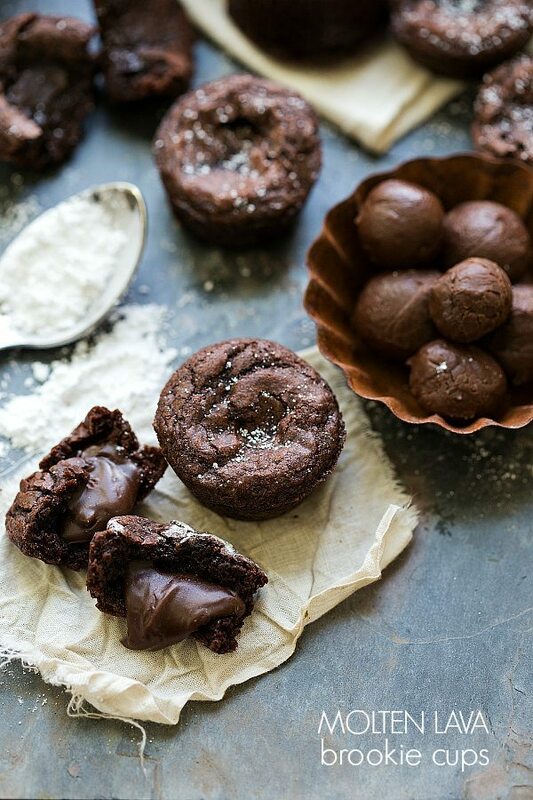 Oh my GOD my chocolate cravings have kicked in after seeing these incredible images. These molten lava cups look definitely fudgy and wickedly delicious Chelsea! Haha that is so cute that you and the hubs order a molten lava cake for your date night 🙂 I love that you made these brookie cups so that you could enjoy them every day of the week! They look SO amazing and perfect for any chocolate lover! haha that’s something we would do – say we’re too full and then totally eat it in the car! And OMG whoa. These look amazing! Absolute brilliance! I think I need lava cake Thursday in my life! These are perfect and sounds like the perfect tradition to start! These would be insanely addicting and I don’t think I would be able to keep a large batch around in the house for self-control purposes. Please tell me you saved me one. Seriously, these are causing fits of drool. This looks like the most sinful chocolate dessert ever! Amazing! WHEN AM I COMING OVER????! Oh my GAWD-I also am a huuuuuge fan of lava cakes and girrrrl….these brookie cups….what the heck….you’re a goddess! I bow down to you! I almost took a bite out of my screen! These look so ah-mazing!!! OMG I cannot wait try these at home! They are so cute! Thanks for sharing! Has anyone actually made these yet? All the comments say “I can’t wait to make these”. I have questions about how to make the brownie batter stay around the frozen chocolate ball when you put it in the tin? My brownie batter is runny, not moldable like it shows in the pictures. Should I partially bake the batter and then put the chocolate ball inside? Please help. How many should this make? I ended up getting a box of brownie mix that was 19.6oz but used a jumbo egg so the dough was still doughy. I made 50-52 of these but have a TON of the middles leftover. How do you get a super thin layer of brownie on them? Oh I had leftover middles too!! You can either make another brownie batch to use the middles in or just roll the middles up and enjoy the as simple fudge truffles 🙂 And by super thin brownie layer, I meant just don’t put tons of brownie batter on top of the center fudgy part. Hope that helps! 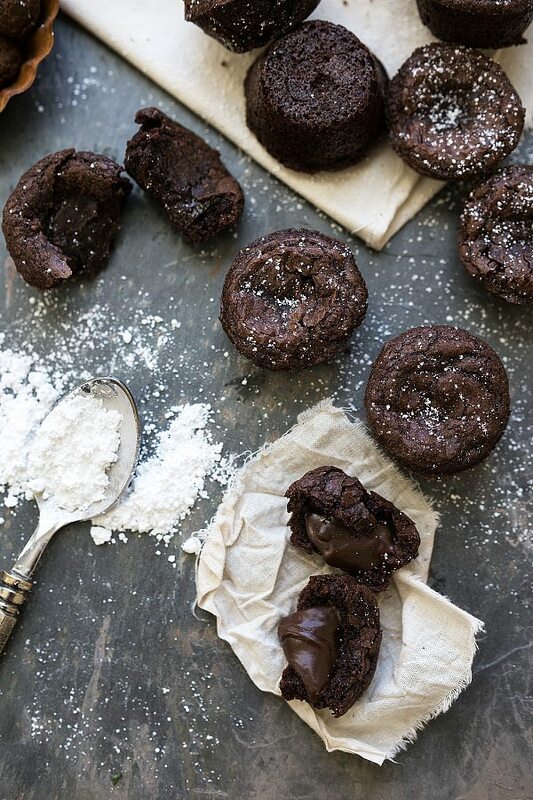 These fudgy molten lava brookie cups are so Instagrammable and adorable! As you know I made it a short while ago and it was lovely! Thx for sharing!